The Activists: Here’s to Julie, Sandy, Darrah, Bonnie and all the other women who understand that poster board and paint can change lives. To the women who own their own megaphone and know how to use it. To the women who let their anger out to play in public and weather the backlash and the bile that rolls their way because of it. The Organizers: Here’s to Lindsay, Lise, Courtney, Andrea, Rebecca and all the other women who hold the clipboard, organize the binder, and remember to bring the M&Ms to the meetings. 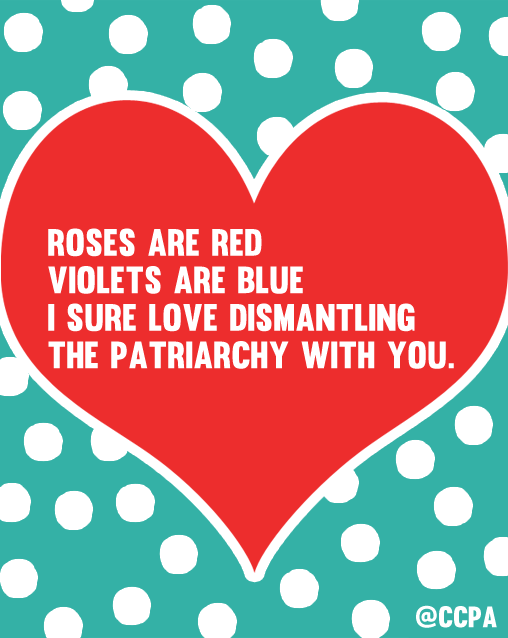 To the women who organize multi-cultural, bi-lingual, all-ages, accessible free events, with free childcare and free food. For free. The Commentators: Here’s to Jessica, Armine, Angela, Apihtawikosisan, Saadia and all the other women who aren’t intimidated by a microphone and a camera or a cursor on a blank screen. To the women who say the thing you wished you had thought of, but didn’t. To the women who articulate our anger, our fears, and our triumphs with snap, crackle and pop. The Detailers: Here’s to Kathleen, Frances, Cindy, Sheila and all the other women who keep our facts straight. To the women who put the methodological smackdown on the doubters and the haters. To the women who like math and know their way around a regression analysis. For showing us the size of the gap and the measure of our progress. The Connectors: Here’s to Erika, Lauren, Kelly, Vicky and all the other women who just seem to know everyone. Who will put you in touch and make the non-obvious connection. Here’s to the women who build coalitions and keep them running. To the women who shore us up when the common ground seems ready to crumble under our feet. The Backers: Here’s to Margot, Nancy, Gail, anonymous and all the other women who put their money where their ethics are. Here’s to every woman who stuffed a $20 bill in the donations box at their local International Women’s Day event. Who wrote the cheque and footed the bill and didn’t ask for a receipt. Here’s to MamaCash. The Visionaries: Here’s to Meredith, Carrie Mae, Gloria, Jayna, Krista and all the other women who dream out loud, in paint and paper and felt and photographs and yarn. To the women who shake us to the core with images and words. Who deliver the raw, the visceral, and the carefully framed. For expanding the possible. Here’s to you, my valentines.